When ultimate performance meets the practicality and striking appearance of the 2017 World Car of the Year, you get the 2018 F-Pace SVR, a fast and furious machine that can also take your family on a weekend road trip. Conway drivers will soon have this beast available to them at our Jaguar dealer. What’s New For Conway Area Drivers On The F-Pace SVR? The F-Pace SVR has been fitted with a supercharged 5.0L V8 engine that churns out a massive 542 horsepower at a torque rating of 501 lb.-ft. This, combined with the new aerodynamic package with unique front and rear bumpers, lets it fly from 0-60 in 4.1 seconds. Larger air intakes at the front and side fender vents lower the pressure in the wheel arches at high speeds, and unique wheel arch extensions provide a look reminiscent of American muscle cars to remind onlookers of the raw power that lies underneath the hood. The F-Pace SVR is the first to use Jaguar’s Electronic Rear Active Differential, which allows the wheels to spin at different speeds hugging curves so you maximize maneuverability. A computer controlled-clutch precisely monitors each wheel to determine what the optimal wheel speed is when handling at performance-level speeds. Also being utilized to improve performance is All-Wheel Drive with Intelligent Driveline Dynamics, All Surface Progress Control, and Adaptive Surface Response to ensure that the F-Pace is performing rain, snow, or shine. 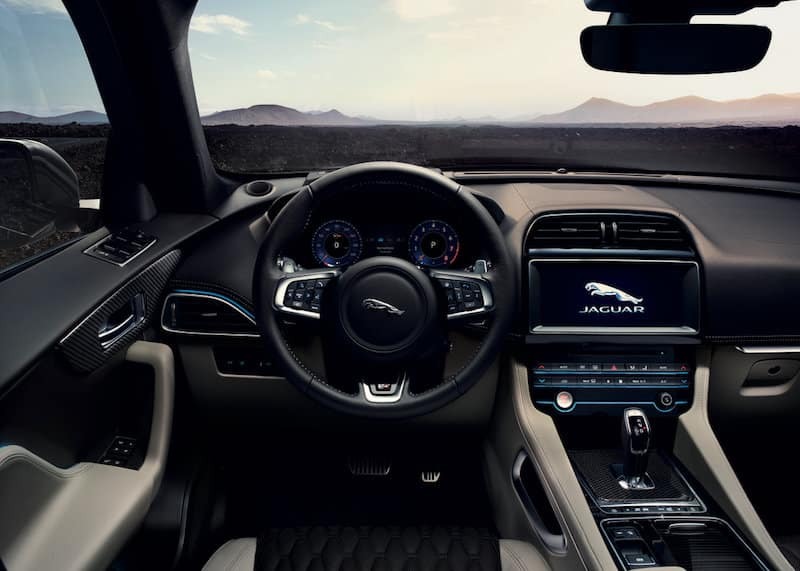 The interior of the F-Pace SVR acts as a reminder of what you’re driving–slimline performance front seats provide enhanced lateral support and feature an embossed SVR logo, and the SVR-branded steering wheel features aluminum paddle shifters so you can take the ride into your own hands. If you can’t wait to get your hands on the SVR, the 2018 F-Paceavailable to Conway area drivers now, is a close cousin to the SUV that won 2017 World Car of the Year. Conway area drivers can check it out today. Contact us today with any further questions about the SVR or to schedule a test drive of one of our Jaguar vehicles.